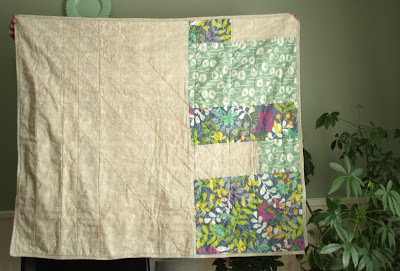 i just added a smaller sized baby quilt to the shop. it was made from mostly vintage sheets, and also the checked floral pattern from free spirit fabric. check it out in the shop HERE. i've been looking for a new table and finally found one. it needs a little work to make the leaf look like the rest of the table, but i love it. we have a tiny dining room, so this smaller table fits better. and i keep seeing the big brown blob under the table from the corner of my eye and i think it's moz. he can't lay under this one! this weekend was spent doing nothing but fun stuff, which was great. saturday dave was recording so i had a whole day to spend doing exactly what i wanted to do, along with some girlfriends. we first went to terrain at styers, which was even more amazing then i imagined. imagine anthropology doing a garden center/cafe, because that is exactly what it is. it was even the dead of winter and the place was amazing. and lunch was amazing too. then we headed over to brandywine view antiques. one of my favorite blogs is freshvintage, and she and her sister opened a "shop" in this antique store to sell all of the freaking awesome stuff they find at yard sales and flea markets. she also happens to be hilarious. seriously, read her blog. look at all the cute stuff they have! i bought one of the aprons and a table cloth. and i must have been temporarily blind, or just overwhelmed, because i was specifically look for planters and missed the ones right there on the shelves. and then we went to chaddsford winery, which was fun. but let's just say PA is not known for great wine. 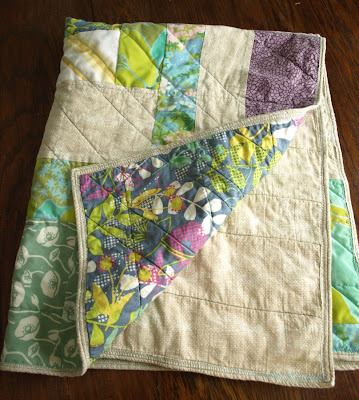 it was made with vintage sheets, (some were my grandpa's, as was the sheet used to make the pillow above. he had awesome sheets!) a vintage table cloth and khaki fabric. it is awesome if i do say so myself. i was going to add yo-yos to it, but they fell apart when i was trying to pin them on to sew. i must not have used strong enough thread, bummer. but i think it turned out well without them. we had lots and lots of snow saturday, about 2ft! and they're calling for another 8-20" tuesday night-wednesday night. snow day! dave made a delicious breakfast. and then another delicious meal. 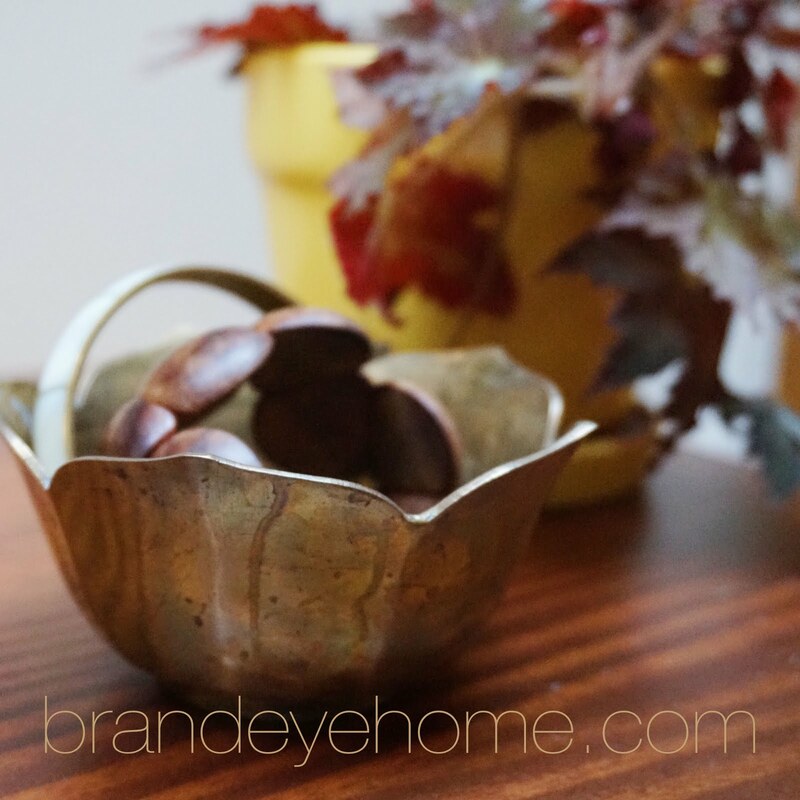 i read about this great, excellent idea on brandi's blog, notyouraverageordinary. -i make a handmade gift for the first 3 people to comment. -i have 365 days in which to send you the gift. -the gift will be a total surprise. -you keep this going by posting pay it forward on your blog. 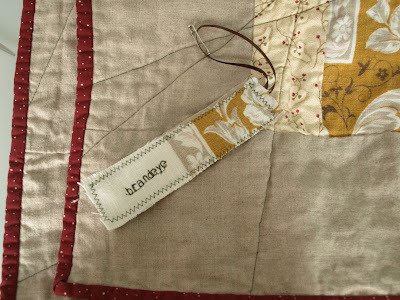 i will be getting a lovely handmade gift from brandi, who i "met" when she commented on my blog. the best is when she comments and says nice things on my blog, it looks like i'm commenting on my work. dave even thought i was. 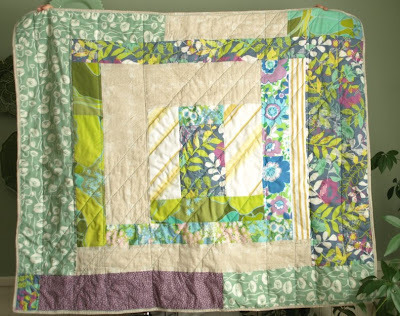 yes brandi, gorgeous quilt! fellow brand-i's are hard to find, we gotta stick together. i'm excited, because this is such a great idea. it gives me a reason and excuse to make things for friends! so the first three commenters will get gifts. i'll contact you for your address. i was just looking through my favorites on etsy and noticed that i've been loving dresses and shoes lately. i do have a few weddings to go to this year, so maybe i should treat myself? this dress is just too perfect because it combines my favorite thing...quilts! into a dress. check it out in the stephanie teague etsy shop. and who doesn't love ruffles? not me, i LOVE them. this dress is from Nostalgia. 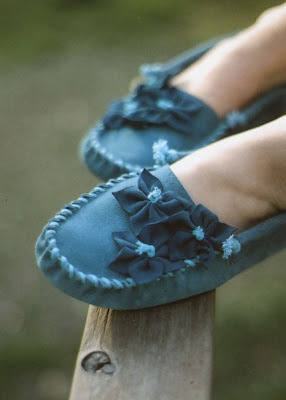 and these shoes are really cute, from darlingtonia. my first named quilt and just in time for valentine's day. i'm sure your sweetheart would love it. 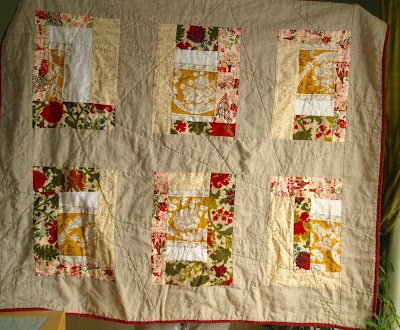 the front blocks are made from a vintage table cloth, vintage pillow fabric and new fabrics and linen. The back is a more random pattern and the whole thing has been quilted with random lines going every which way. 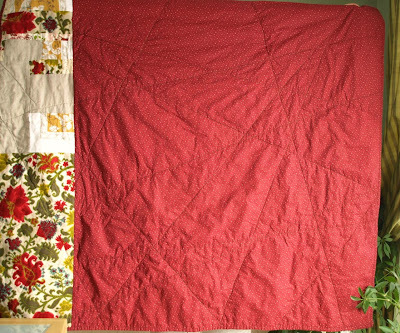 today i finished up the valentine love quilt (it has been named :-) and it's being washed and dried. i always get nervous when i wash them, because i had one fall apart in there! it was heartbreaking. and i started on a new quilt. here are all the fabrics, i made some changes after this was taken. i started by laying out the pieces i wanted to use. 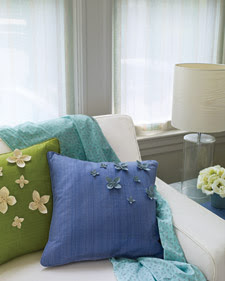 it is almost all vintage linens and table cloths. i liked the shape of the circular table cloth so i'm going to incorporate that into the quilt. here is a rough sketch. i changed some of it so far and i'm sure i'll change even more before i'm finished. this one is my favorite so far. it's called floral galaxy.